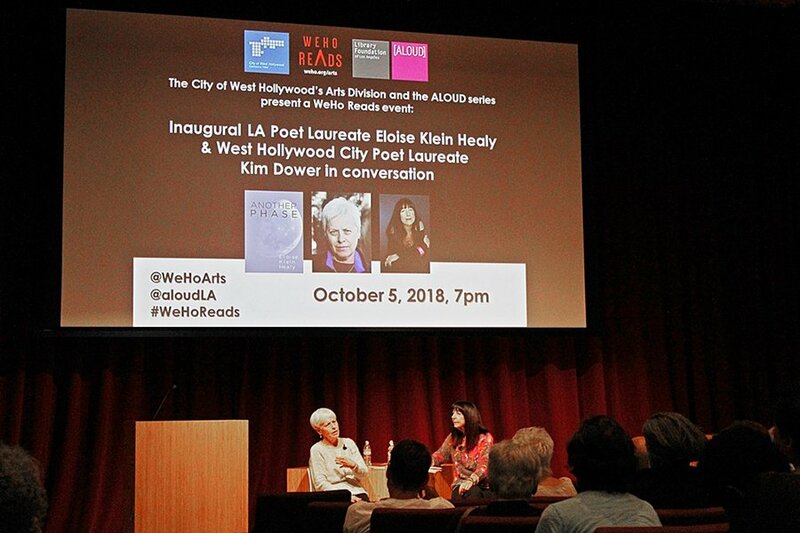 WeHo Reads presented an intimate conversation and poem reading by Inaugural Poet Laureate of Los Angeles, Eloise Klein Healy. The event was hosted by West Hollywood Poet Laureate Kim Downer, at The West Hollywood City Council Chambers, on Friday, October 5. Healy read from her newest book, Another Phase where she discussed how she came back from struggling with aphasia. Aphasia is a disability where the brain is unable to express and understand words. Healy was stricken with aphasia after having being diagnosed with encephalitis which is an inflammation of the brain. It took Healy two years to find her words and to recover from Aphasia. During those years, she struggled with finding the words in her brain. Examples she gave were when she struggled for the name of an Apple and when she was unable to find words and names of colors. It was her journey back to poetry which helped her the most, a long with with a woman named “Betty” who she mentioned many times during the evening. Betty helped and coached her to regain her words. She had her create five-line poems. This tool seemed to be Healy’s best exercise to regain her vocabulary. 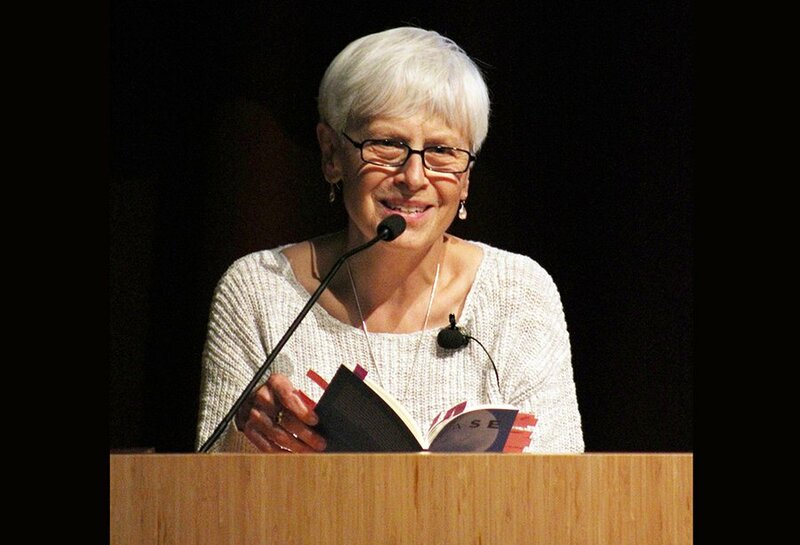 During the evening Downer asked Healy to read some of her word-saving, five-line poems, as well as poems from her newest book “Another Phase.” Healy even honored those in attendance with readings of a few never-before-heard unpublished works. The evening was engaging and the audience was captivated by Healy’s story and her art of poetry. 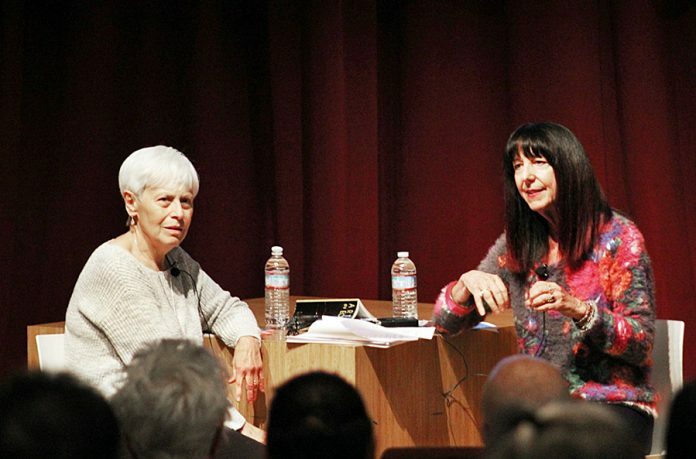 The event was co-presented by the City of West Hollywood’s Arts Division and ALOUD, the Library Foundation of Los Angeles’ celebrated literary series of conversations, readings and performances. This event was also an official selection of Lambda LitFest LA 2018. Friday, November 9, 2018 – 7pm: An Evening with Michael York discussing his new book “The Readiness is All.” Inspirational, entertaining, and heroic, Michael York’s odyssey reveals more than one person’s encounter with disease – it will empower anyone confronting adversity, especially those turning to the soul for hope. 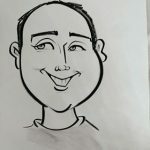 The book chronicles his experiences with Amyloidosis, a blood plasma disorder from which he suffered and for which he as treated for among other therapies, with two stem cell transplants. Tuesday, Dec 4 – 7pm: Tales from the Strip, A Century in the Fast Lane. Stories from the Sunset Strip with Gordan Van Sauter, Robert Landou and Frans Evenhuis.